by Grown-up Travel Guide Contributor in Features, Home, Places, South America. 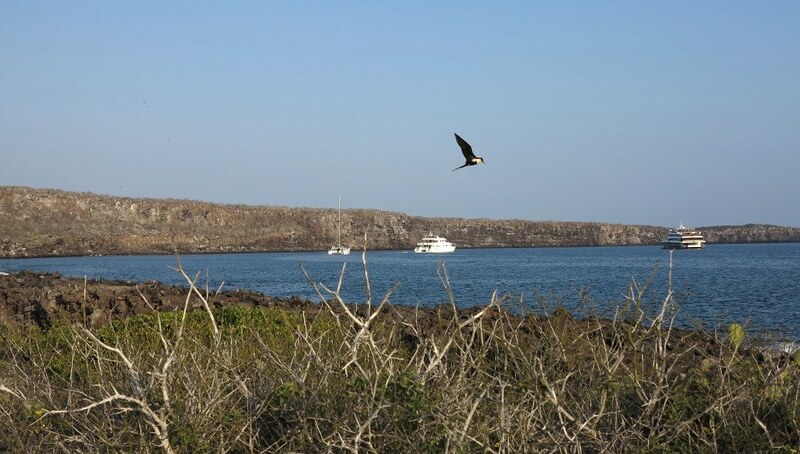 There are two ways to see the Galapagos Islands – on a cruise or under your own steam. Either method of travel can be a great experience if you plan it right, and my wife Carmen and I enjoyed both styles on our recent trip to this magical archipelago of islands off the coast of Ecuador. We spent four days aboard a luxury cruise and followed that up with six days of diving and day trips – a good mix that cut some costs while still allowing us to see everything we wanted to see. 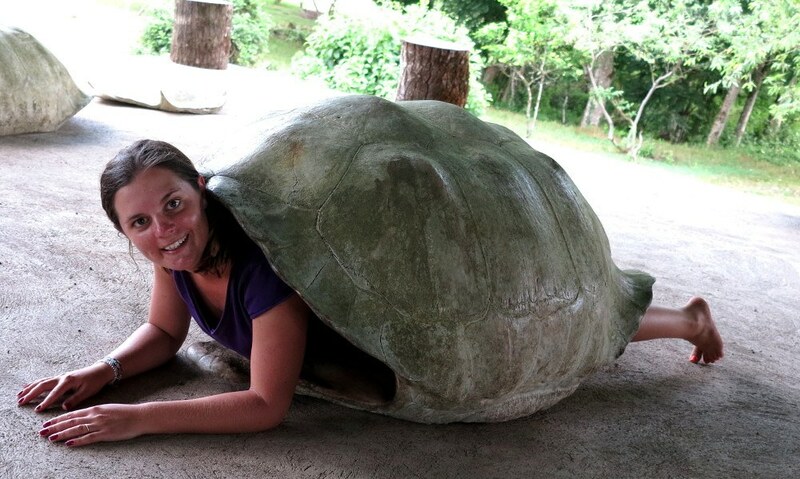 Carmen even got to experience life as a giant tortoise! 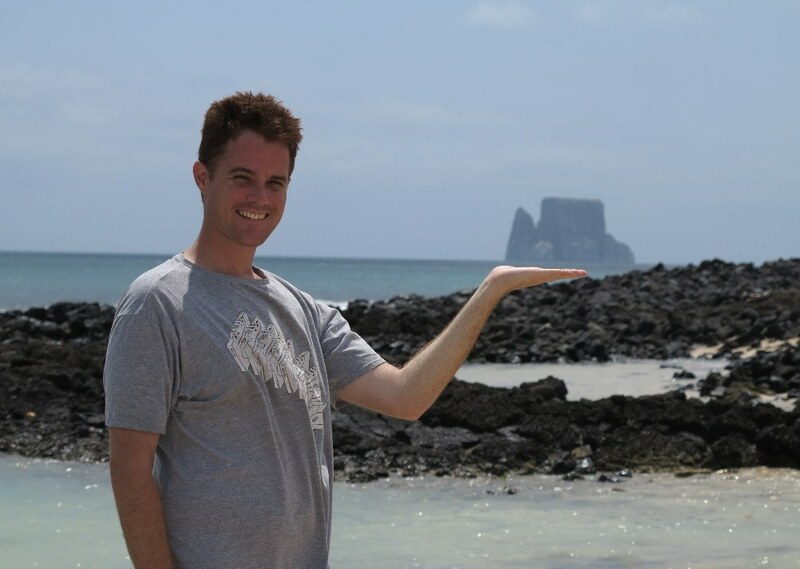 But no matter what you decide to do, the Galapagos Islands are a special place, unique in the all the world and deserve your time and appreciation. Going there is more than a holiday. Whether you book a cruise or draw up your own itinerary, journeys to the Galapagos start in Ecuador’s capital Quito or from its second city Guayaquil. Flights usually go Quito-Guayaquil-Baltra (the Galapagos’ main airport) so if you want to save some hassle just fly straight from Guayaquil. Carmen and I paid a total of US$860 for return tickets flying with LAN airlines in the middle of the peak tourist season. If you book a cruise many operators will organise flights for you as part of the package. The Galapagos is an expensive place and the moment you arrive at the airport the gouging begins. You need to grease an official’s palm with US$10 to get your bag scanned for creepie crawlies and other potentially damaging items that could be accidently taken to the islands. After landing in the Galapagos get ready to part with some more cold hard cash. Every new arrival over the age of 12 pays $100 as an entry fee to the National Park, and under 12s are slugged $50. Thankfully, you then get a free bus to the ferry that takes you across the narrow sea channel from the island of Baltra to San Cristobal. The ferry costs 80c per person and you will very likely see your first marine life on the short journey – we saw a sea turtle and were immediately hooked! Carmen and I got to go on a press trip aboard the Seaman Journey, an elegant catamaran, and enjoyed a luxurious cruise that would normally set you back around $2,000 per person for a four day trip. Last minute deals are a great way to save costs – if you have the nerve! We met a couple on board who paid less than half of the usual cost of the Seaman Journey by snagging a last minute deal. 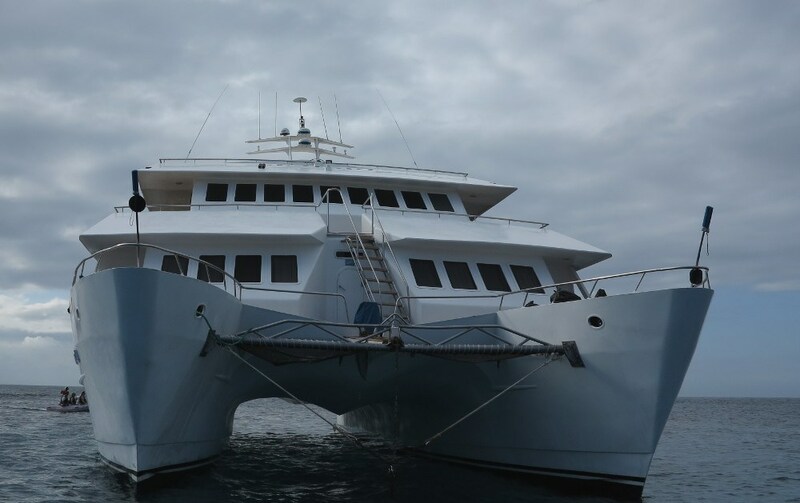 No matter how much you pay, once you’re on board a Galapagos cruise you don’t need to worry about anything. In fact, you can lock your wallet away in the safe and not pull it out again until you hit dry land. A cruise will usually include all of your food and non-alcoholic drinks, a naturalist guide and equipment like snorkels and flippers. On the Seaman Journey the only things we had to pay extra for was alcoholic beverages and wet suit hire; plus it is customary to tip the crew and guide at the end of the voyage. 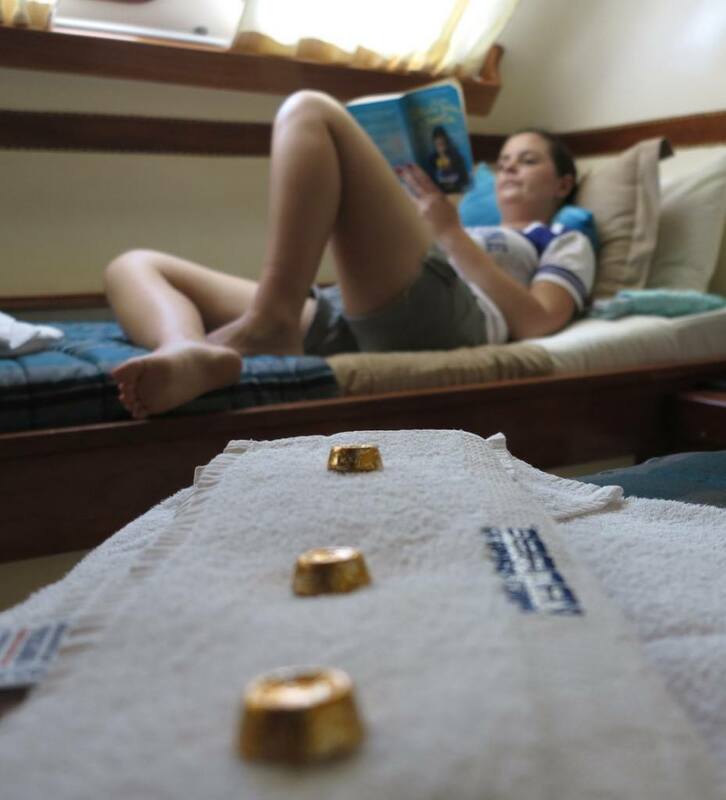 Our cabin was at the very front of the main deck and had two single beds on either side. 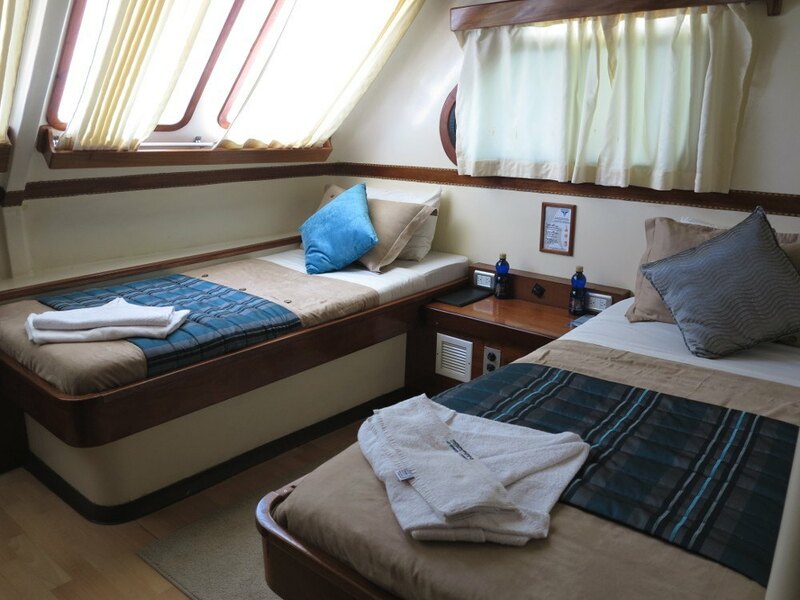 That may sound a bit inadequate for a married couple but the boat sails at night and the seas can be rough – so having your own bed saves a lot of discomfort and is a bit safer. The beds were very comfortable and were made up fresh every day ‘Navy style’ with crisp sheet folding and tucking by the ever working crew. There was a freshwater shower with very hot water, simple sink and toilet set up and very grippy floor to help you wash when the sea was rolling. I could go on and on about the colour and the shape of the yacht – which was first class – but the real luxury of the Seaman Journey, indeed any Galapagos cruise, isn’t to be found onboard. Our days on board the cruise had a rhythm. Up by 7am for breakfast then the first activity would start around 9am. We would take a ‘panga’ boat to an island and explore its flora and fauna guided by our naturalist. Then we’d return for lunch and go back out again at 2pm for an activity like snorkeling. A snack at 4pm was followed by the final outing to another island and then back on board for dinner at 7pm. Rinse and repeat! 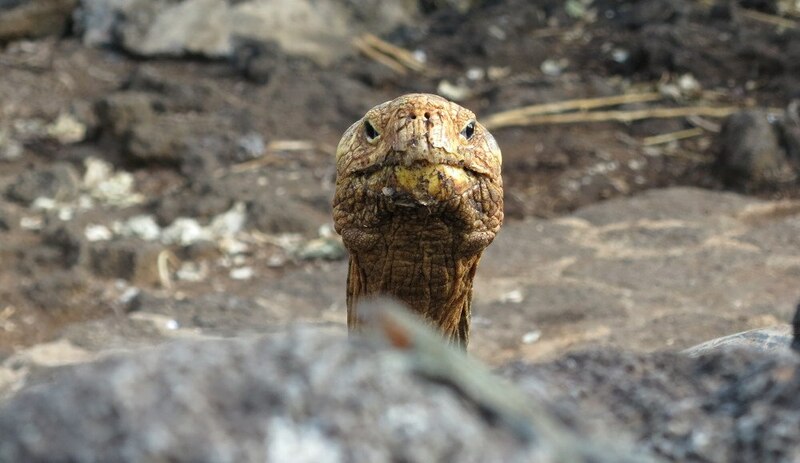 We saw, up close and personal, just about every single unique animal and plant the Galapagos has to offer. Frigatebirds, boobies, hawks, gulls, land and marine iguanas, giant tortoises, sea lions, dolphins, petrels, white tip sharks, cow nosed golden rays, tropical fish, octopus and giant cacti. At night the boats sail between islands so when you wake you’re right on the doorstep of the next destination. This is the big advantage of a cruise. Transportation is hassle free and you don’t have to expend any energy getting to the places you want to go – you let the ship’s engines do that for you. Plus, a lot of the Galapagos’ islands are quite distant or difficult to reach so people who go under their own steam can often miss out on very special places beyond the reach of day trips. For instance we went to the small islands of South Plaza and Santa Fe which are quite out of the way and two of the few places you can see giant cacti. We also went to North Seymour island where you can see scores of frigate and boobie birds in their natural habitat. These islands are very difficult, if not impossible, to reach for travellers who don’t take a cruise. The tide came in as we returned from an island trip so we had to wade back – great fun! The luxury part of the cruise really came to the fore through some nice touches – small things that make your day. The Galapagos is all about getting hot and sweaty and mucking in as you set off to explore the islands and do activities like snorkeling. Every time we came back to the boat from an outing, the crew handed us a fresh cold towel to wipe ourselves down with, and then served a healthy snack like fruit skewers. We would also be served an ice cold fruit juice, just the thing you need after a spirited outing. It’s these little things that add up to make the cruise a luxurious one. The cruise companies aim to make your stay in the islands as hassle free and as comfortable as possible and the smaller the boat you cruise on the more this effect is magnified. 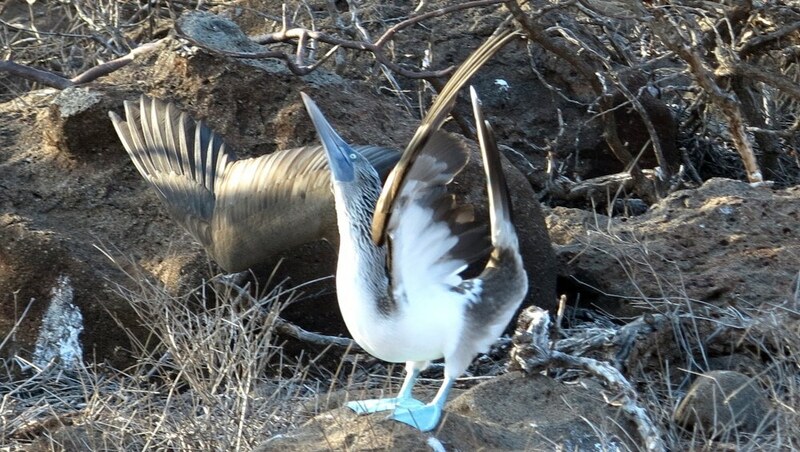 If you choose to see the Galapagos under your own steam you will be surprised at how easy it is to organise. On the days Carmen and I were left to our own devices we mostly just winged it! We took the Galapagos in our own hands and found the going quite easy! The main inhabited islands like San Cristobal and Santa Cruz have large towns filled with tour operators offering everything from days trips to other islands, to three and five day tour packages. There are scores of hotels and hostels and guest houses – something for every budget – and the best part of staying local is that your money stays within the community. We became quite friendly with our naturalist guide on board the Seaman Journey and he offered to let us stay in an apartment he owned for free. He explained that it would be a great benefit to his community if we stayed there and spread our custom around. We had a look at the competition on San Cristobal and you can score a very simple room for at least $50, rising up and up the nicer you go. There are very arty guest houses for around $200 a night and fancy hotels far beyond that price range. If you want to move between the islands there are ferry services that cost around $30 a head that will take you from one place to another in the morning and afternoon from the main docks. 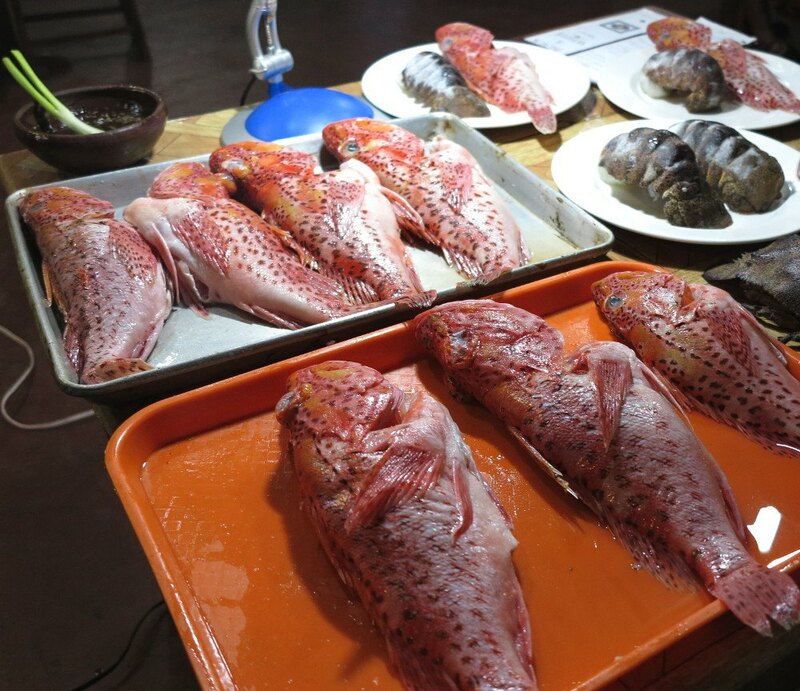 Eating out is easy on the islands – we worked out that it was actually cheaper to go out than to shop and do our own cooking – the groceries are very pricey. There are scores of places that open early for breakfast and for under $5 you can get eggs, toast, coffee and a juice. Most restaurants have a $5 special for lunch and dinner, usually fish with rice and vegetables. Or you can choose a more expensive seafood dish with all the trimmings. Our best dining experiences were on the island of Santa Cruz where an entire street of outdoor restaurants opens in the evenings. It’s three streets back from the harbour and easy to find – just follow the crowd! We sat under fairy lights and ate our way through lobster, fish, ceviche and patacones for under $20 a head each time. As for drinks, beer is cheap but wine is very expensive – we paid $8 a glass at one restaurant – and it was corked! If you want spirits be prepared to sell your soul. 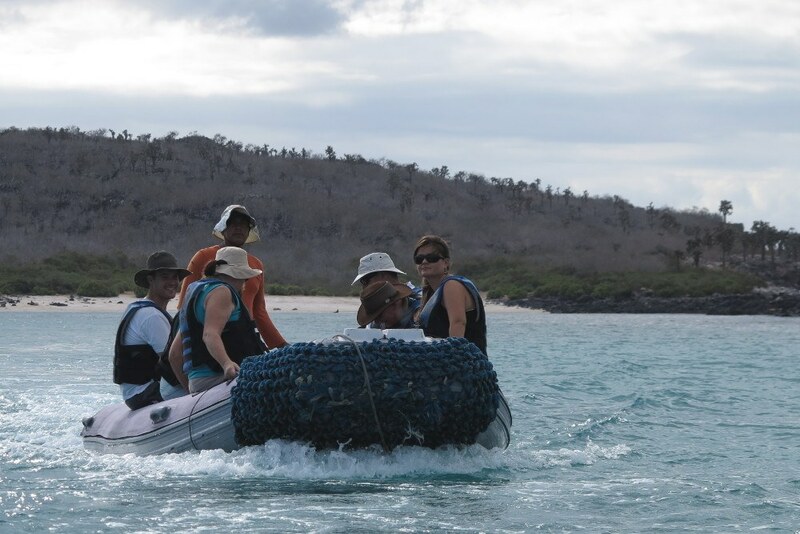 Wherever you decide to stay, the Galapagos is about activities, not sleeping! 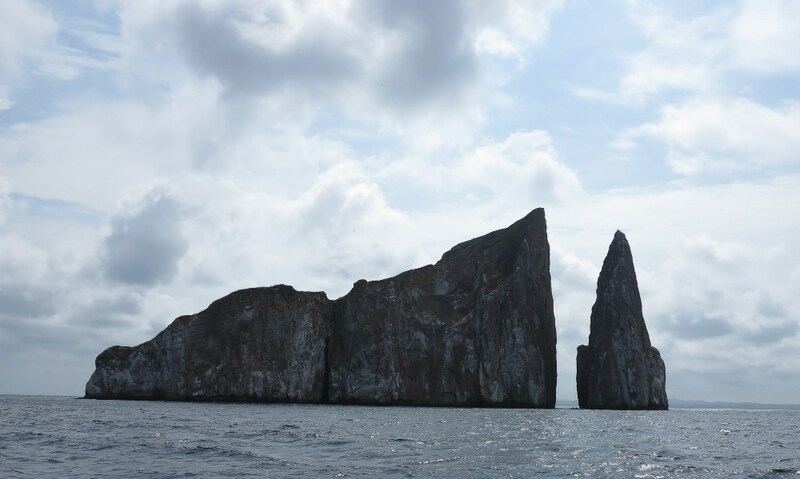 While staying on San Cristobal we spent most of our time scuba diving – going up the coast to the utterly amazing Kicker Rock (also known as Leon Dormido) and diving in the harbour to explore the wreck of a mysterious freighter that no one knows the identity of. Kicker Rock is a great place to go for a day trip – you can snorkel there for upwards of $50 with a local tour company, while a dive is $150 plus for two tanks. Lunch is usually included and it’s a very impressive place to visit. San Cristobal also has a beach called La Loberia just beyond the town’s airport that you can either walk to or take a taxi for $2 to. A short walk along the coast brings you to a sheltered bay where you can snorkel with giant marine turtles, sea lions and reef fish. It’s a magical place, particularly in the late afternoon when the turtles are abundant. There are also a number of hikes to miradors (look outs) that begin at the interpretation centre on the edge of San Cristobal near the Playa Mann, the main beach. This area is called Las Tijereta. Santa Cruz is even better for local activities. It’s closer to the middle of the archipelago so doing day trips to other islands like Bartholomew and Isabela is cheaper. 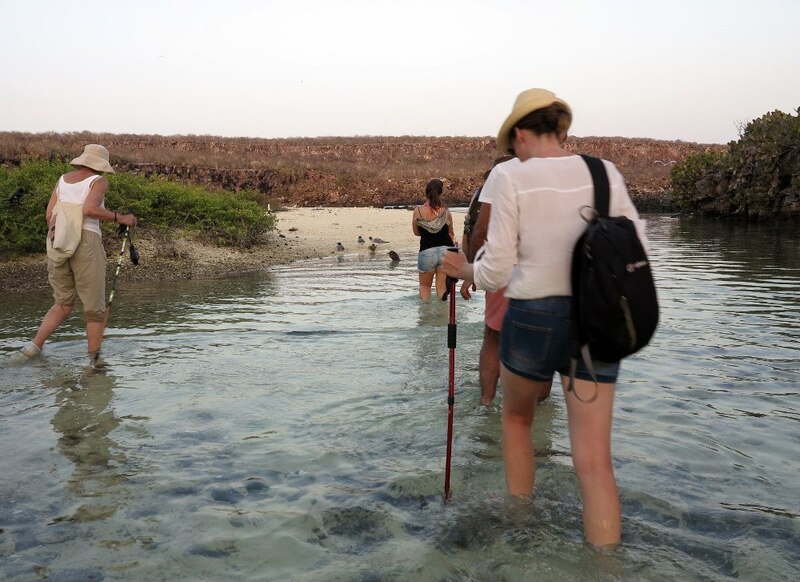 We paid $180 each to go to Isabela and had a great time visiting pink flamingos, giant tortoises and snorkeling with Galapagos penguins and white tip sharks. Even better, we got back in time for happy hour. You can also book day trips to local attractions on Santa Cruz. Just hit the pavement and ask for quotes from the local operators. 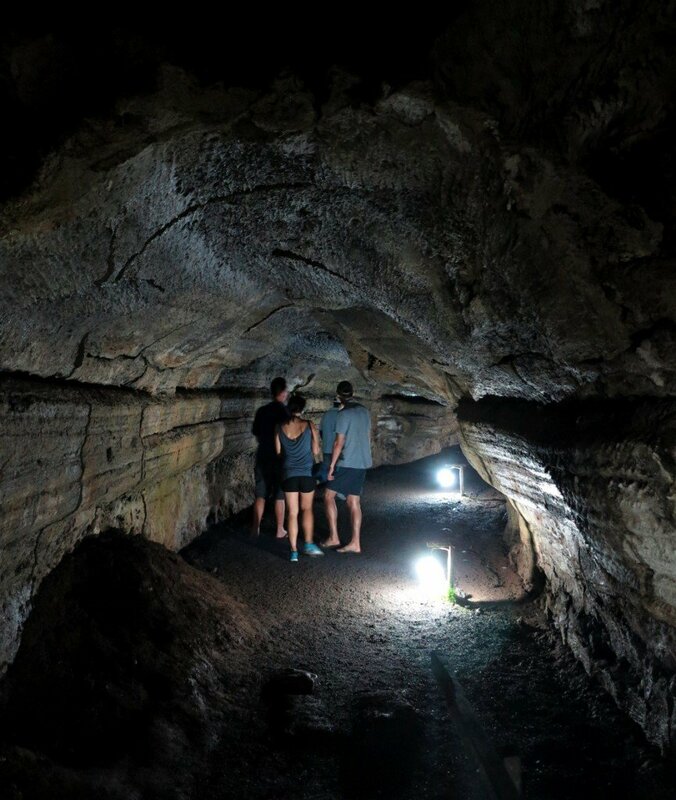 We paid $25 to visit the lava caves and the giant tortoise sanctuary – an amazing experience where we saw the animals mating and walked through tunnels carved millions of years ago by flowing lava. There’s also the The Charles Darwin Centre, a sanctuary for many species of Galapagos animals including iguanas and tortoises. It’s well worth a look, especially in the morning before the crowds gets there. If you’re planning a trip to the Galapagos it’s important to keep in mind that both cruises and doing your own thing have advantages and disadvantages. A cruise will show you a lot of things in a short space of time but you will pay for the privilege. Going out on your own will be cheaper but you may not see as many things and have to work twice as hard to get around. Our recommendation is that you split your time – do a cruise and then do your own thing. That way you get the best of both worlds. Disclosure: The Seaman Journey provided us with complimentary accommodation onboard for three nights and four days. Our views are our own. About the author: David Allan-Petale lives a nomadic life, continuously journeying with his wife Carmen. They document their travels on their travel blog, Double-Barrelled Travel, which specialises in video content. They’ve just returned from the Galapagos and plan to travel up through Central America to Mexico by December. You can find details of their adventures and travel tips on Facebook, Twitter, YouTube, Pinterest and Google+.